The main floor has three wireless access points (two of them labeled) represented as yellow spheres. The 12 inch thick concrete walls attenuate the WiFi signal a lot but there is some penetration. A drawing like this is commonly called a heat map -- even though the hottest regions are represented by the coolest color (green). 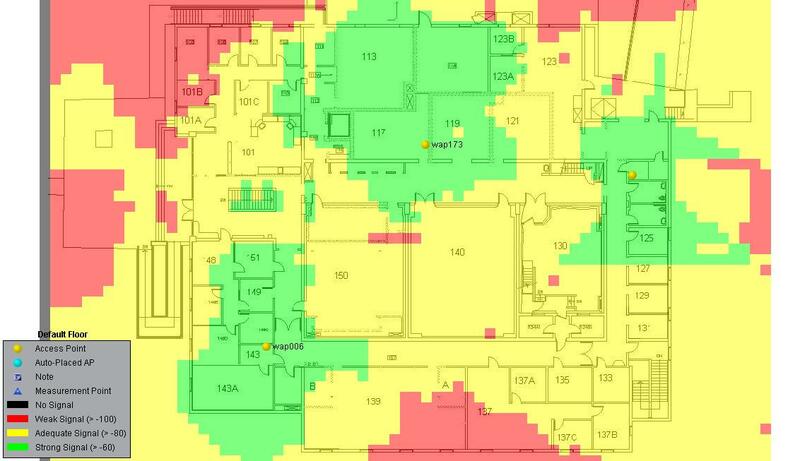 This sample heat map was produced with a program from Helium networks. The data are collected on a laptop preloaded with a building map. The operator walks around the building and mouse locates her position on the map at regular intervals while the program reads signal levels continuously. That some of the room numbers are legible while others are not is testimony to the importance of starting with a good building plan drawing. Not shown here, but the system measures the signal strength of all the access points within range -- not just the ones that were officially installed. It thus can help evaluate radio interference problems. These maps have considerably higher resolution than the Cruznet maps on the web. But they are considerably more expensive to produce. No decision has been made turn this into a production system. We are presently evaluating the cost of producing this kind of documentation. The building is about 390 ft long. Its windows have a metal film heat reflective treatment that substantially blocks radio signals. The algorithm the program uses to extrapolate from point measurements to area coverage assumes one over R-squared fall off in signal unless informed otherwise by measurements on both sides of a highly attenuating obstruction. This survey was done fast (30 minutes) taking readings in the hallways and some of the walkways directly outside the building skin. A good survey of this floor would require more data. Still, important conclusions can be drawn -- this floor is well covered by four APs. Interference between aironet-20 and aironet-19 -- both on channel 1 -- is negligible. Interior walls are sheet rock on metal studs and offer negligble attenuation of about 2 dB.